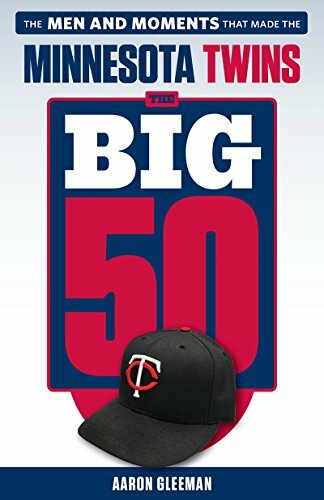 Jim Thome went deep twice Saturday to tie and then pass Harmon Killebrew for 10th place on the all-time home run list with 574 and as he got back into the dugout following the second blast the Twins played a pre-taped congratulatory video message from Killebrew on the Target Field jumbotron. It was a very nice touch and clearly meant a lot to Thome, who spent the next couple minutes bear-hugging anyone he could find in the dugout. Thome edges Killebrew by 21 points in batting average, 28 points in on-base percentage, and 46 points in slugging percentage, but his leads are largely due to playing at a time when runs are far more plentiful. 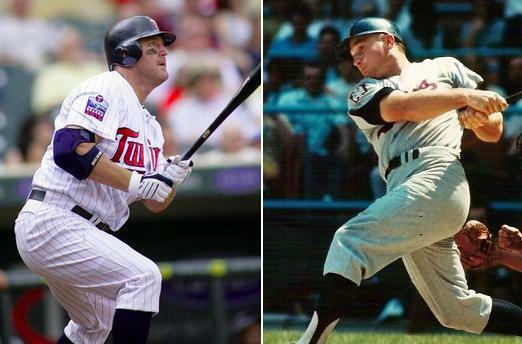 As a whole the league has a .272 batting average and .772 OPS during Thome's career, compared to a .259 batting average and .724 OPS during Killebrew's career. That's a 48-point difference in league OPS and the actual gap between their OPS is 77 points. All of which is why Thome holds just a slight edge (146 to 143) in adjusted OPS+, which takes eras and ballparks into account. And the rest of the raw numbers are amazingly close. Games: 2,435 to 2,340. Plate appearances: 9,831 to 9,619. Homers: 574 to 573. RBIs: 1,592 to 1,584. Walks: 1,646 to 1,559. Along with Mickey Mantle, Mike Schmidt, and Barry Bonds they are two of just five players ever with 500 homers, 1,500 RBIs, 1,500 walks, and 1,500 strikeouts. One area where Thome has an edge is that he's having a fantastic season at age 39, whereas Killebrew had his last good season at age 36 and retired after hitting .199 as a 39-year-old for the Royals in 1975. When the Twins signed Thome and talked about him mostly as a bench bat my hope was that Ron Gardenhire would quickly realize he was still far too dangerous against right-handed pitching to not start regularly. Thome started 18 of the first 31 games before Delmon Young's emergence cut into his playing time, which combined with interleague matchups in NL parks led to just nine starts in the next 44 games. However, since finishing up the interleague portion of the schedule Gardenhire has cleared room in the lineup for both Thome and Young in six of seven games by shifting Michael Cuddyer from right field to third base, where he hadn't played since 2005. Cuddyer has predictably been pretty brutal there defensively and is hardly hitting well enough to make up for it at the plate, but Gardenhire deserves credit for not simply making Thome an incredibly overqualified pinch-hitter. Thome has hit .266/.391/.594 with 10 homers, 10 doubles, one improbable triple, and 27 walks in 156 plate appearances to rank second on the Twins in OPS behind only Justin Morneau (and 165 points ahead of anyone else). Not only has Thome been an excellent pickup for the Twins, at just $1.5 million in guaranteed cash plus some incentives he's been one of the very best free agent signings in all of baseball. I loved the signing at the time, I'm pleased that Gardenhire has played Thome more than the initial talk of his role indicated, and after watching him destroy Minnesota pitching for a couple decades it's been an awful lot of fun to see the future Hall of Famer mash for the Twins. Thome is so ridiculously good that he should bat higher in the order. Cuddyer is so dreadful against RHP that he should be benched altogether, with Tolbert or Valencia (shocking, I know) playing 3B in his place (or Punto if their numbers are a result of a small sample size, since Punto’s hitting vs RHP is similar to Cuddyer’s but his defense at 3B is vastly superior). First of all, Hardy is so awful that if his numbers don’t improve with a larger sample size, perhaps he should be replaced against LHP by Punto, or even Casilla (whose sample size is 10 PA, so let’s hold off batting him cleanup; his career LHP/RHP splits are nearly identical). Thome is also awful vs LHP and cannot play. Kubel & Young are both showing surprisingly small RHP/LHP splits this year, so stick them at DH & LF, respectively. Cuddyer suddenly looks like an All-Star, but should stick in RF. Let Valencia have a chance to play 3B vs LHP, as well, and see if his numbers are a mirage or not (unless the Twins acquire Mike Lowell). Also, I know it’s sacrilegious, but at least for now perhaps Cuddyer should bat third vs LHP (in front of Morneau), Young should bat 5th, and Mauer can be pushed to 6th. In addition to more accurately reflecting their numbers vs LHP this year, this righty/lefty/righty/lefty heart of the order would create more difficulty for opposing managers and bullpens in the later innings of games (with Thome and others on the bench in case of a RHP reliever anyway). I guess I haven’t watched games with the regularity I once did, but the most brutal things I’ve seen Cuddyer do while wearing a baseball glove have come in right field. He just doesn’t cover ground out there (see Bartlett, Jason, and the start of Saturday’s eighth-inning disaster) and hasn’t been able to for awhile. More importantly, I think some folks (certainly I) have overrated this team. In March-April I really though this would be Gardy’s best club (and thus, the best Twins team since ’91), but the only time they’ve won consistently was in the first month playing almost exclusively vs. the AL Central. 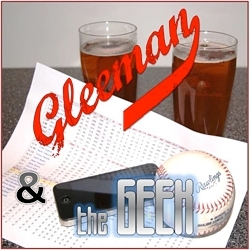 Against every other division, even the sucky NL, the Twins have really been mediocre. So yeah, they’ll get a lot of division games from here and probably start winning again, but this is starting to look like just another Gardy team that will struggle to get to the post-season and then (if they get there) be a quick out. Yawn. Alex and Neil’s comments are ROTM. Right on the money. Real managers don’t calcify the batting order. Players repect the numbers. Since Cuddy has been appearing at third you continue to remind your readers that he has been brutal at third in the past and currently. Can you please reference some specific plays? From my perspective Cuddy has been markedly better at third base this year (as oppossed to 2005). I have to agree with Neil in regards to Cuddy’s inability to cover ground in RF. It seems as if even Kubel and his repaired knees cover more ground than Cuddy. I would rather see Valencia at third, however, given that Gardy is going to play Cuddy I like him in the game at third.